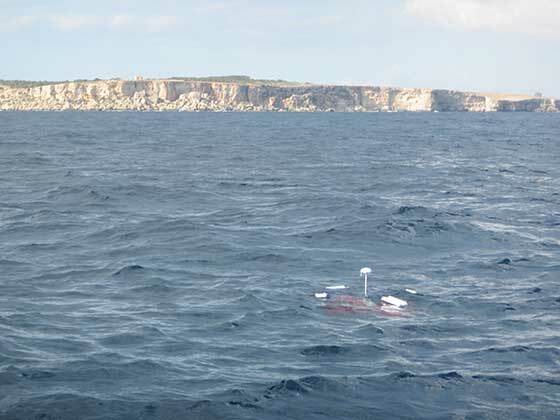 Earlier this week, staff at the Physical Oceanography Unit (PO-Unit) within the University of Malta (Prof. Alan Deidun, Mr, Adam Gauci, Dr. Anthony Galea, under the coordination of Prof. Aldo Drago) organised the deployment of three coastal lagrangian sea drifters at various distances from the mouth of Mellieha Bay, which was chosen in view of its importance for bathing. 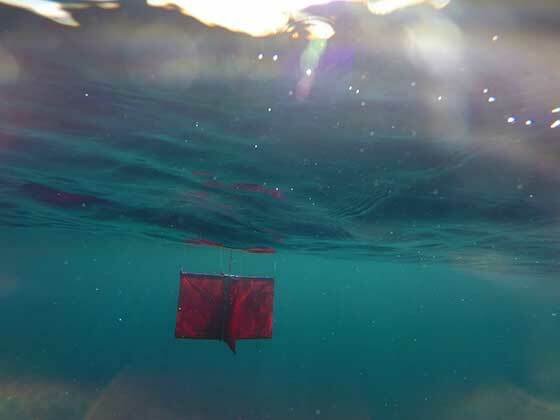 The drifters consist of a surface buoy and a 1m-deep subsurface drogue which senses the sea currents measured from successive positions of the buoys using real-time satellite tracking. 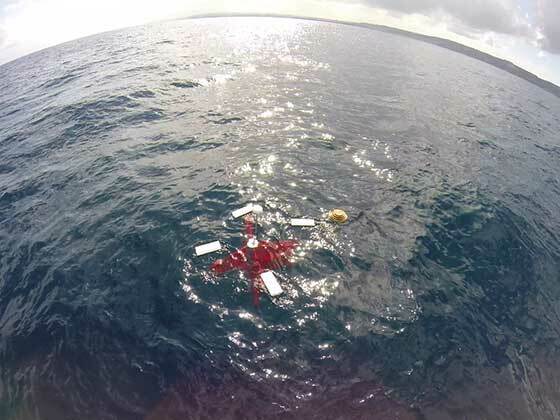 The survey is intended to make direct measurements of sea surface currents (direction and strength) and sea surface temperature to obtain key information for the validation of numerical models that can simulate the dispersion of jellyfish blooms and predict their incidence on coastal areas. The tracking of the drifters can be viewed in real time on a web interface and this drifter deployment complements the deployment of 3 open-water (not coastal) drifters the north of Gozo in October 2013, still within the MED-JELLYRISK project. The jellyfish dispersion model will constitute the basic element of a prototype system intended to act as an early warning of jellyfish swarms impacting our beaches, which is being finalised within the PO Unit, with the assistance of foreign experts. 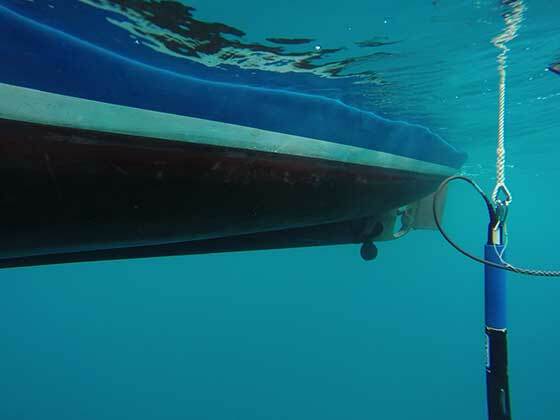 During the same deployment, water temperature, pH, salinity and dissolved oxygen profiles were taken within the water column by means of CTD equipment. Every summer, two million bathers are affected by jellyfish stings on a global scale. The Mediterranean coasts are facing increasing jellyfish outbreaks resulting from a variety of human activities including maritime transport, exploitation of living resources, discharges and other impacts deriving from climate change. The MED-JELLYRISK Project aims to assess the socio-economic impact of jellyfish blooms and tries to implement mitigation counter-measures against this ever-increasing problem. The project is implementing an integrated coastal management approach within 10 Marine Coastal Zones (MCZs) in the western and central Mediterranean Sea to introduce measures and solutions against jellyfish proliferations. The University of Malta participates in this project through the PO-Unit and the Department of Biology. The MED-JELLYRISK Consortium includes four other partner institutes from Italy, Spain and Tunisia, namely; Consorzio Nazionale Interuniversitario per le Scienze del Mare (CoNISMa), Institut de Ciéncies del Mar - Consejo Superior de Investigaciones Científicas (ICM - CSIC), Faculté des Sciences de Bizerte - Département des Sciences de la Vie (FSB), and Institut National Agronomique de Tunisie - Département des Ressources Animales, Halieutiques et Technologies Agroalimentaires (INAT). The Project is funded under the ENPI-CBC Mediterranean Sea Basin Programme 2007-2013, co-financed by the European Union. The multilateral cross-border cooperation "Mediterranean Sea Basin Programme" is part of the European Neighbourhood Policy (ENP) and of its financing instrument (European Neighbourhood and Partnership Instrument - ENPI). The programme is co-financed by the European Regional Development Fund (90% EU funds; 10% MT funds).